DSCA is recruiting for a Supv Program Analyst, GS-0343-14 with the duty location in Arlington, VA. This position is within the Security Cooperation Workforce Development Directorate. o Highly motivated self-starter able to operate with minimal in-country oversight. o Prior demonstrated experience providing logistical advisory support in Sub-Saharan Africa. o French competency with strong written and verbal communication skills or use of translation services, as necessary. CS Lead Planner will develop Communications Strategy, managing a 4-person team with knowledge of international relations, Northeast Asia regional expertise, Korean language proficiency, planning, Exercise and contingency support, computer graphic design, magazine and collateral print media production, MOP and MOE analysis, Key Leader Engagement (KLE) and Spheres of Influence administration, political- military expertise, collection, research, and analysis of CS relevant information on all domains, and problem solving. The Contractor shall accomplish the above services in a dynamic environment, often event driven, that uses multiple venues and media to communicate USFK Commander’s objectives and messages to a variety of relevant audiences. The goal is to maintain a comprehensive understanding of the regional pol-mil and information environments to inform the communications strategy and provide the right message, of the right content, at the right time to the right audience. Coordinates and synchronizes UNC/CFC/USFK CS initiatives within the headquarters staff and service components, and with DOD, USJCS, USPACOM, ROK MND, and ROKJCS. Coordinate UNC/CFC/USFK actions with PACOM, the ROK JCS, and the ROK/US interagency community. A Washington D.C. based embassy is seeking a Head of Scheduling and Planning for its executive level staff. The Head of Scheduling and Planning will provide timely and proactive management of all aspects of the Ambassador’s official schedule. The Head of Scheduling and Planning will combine administrative and representational duties. The Head of Scheduling and Planning will also work closely with the heads of function within the Embassy. · Coordinate said agenda with the Chief Security Officer. · Keep embassy staff abreast of all scheduling activities and requests. · Prepare detailed itineraries for the Ambassador, including contact names, numbers and locations. · Ensure that the Ambassador is provided germane briefing materials prior to each event in coordination with pertinent embassy staff. · Maintain the Ambassador’s files/databases to include travel documentation, contact correspondence, and relevant meeting notes. · Coordinate travel for the Ambassador’s family including security and trip itineraries. · Perform duties as needed. Description of Work: Develop country aviation training plans for develop 818th Mobility Support Advisory Squadron (MSAS) that support U.S. Africa Command (USAFRICOM) Theater Campaign Plan (TCP), Air Forces Air Forces Africa Command (AFAF) Country Engagement Plan, and Department of State (DoS) Country Plan security cooperation objectives. Country training plans shall include a baseline assessment of partner nation capability, the recommended training programs to reach desired end states, time-phased milestones (including entry and exit criteria), and proposed Measures of Performance and Measures of Effectiveness (MOE) to monitor and assess program stability and progress towards reaching the desired end state. - Undergraduate or Masters degree (Masters degree is preferable) in international affairs or international affairs-related field. -Working knowledge in international affairs, security cooperation, or GCC staff at the Number Air Force (NAF) or MAJCOM level. Experience in the USAFRICOM AOR preferred. -Knowledge and skills to develop and document detailed training requirements with specified skill set(s). Skills and knowledge include recent practical working experience with USAF security assistance training programs (SATP), policies and procedures, knowledge of USAF aviation and aircraft systems training methodologies, intergovernmental working relations between Department of State (DoS)/Department of Defense (DoD)/Embassies to develop, define, plan and or monitor international training. - Possess a secret clearance. - Ten years of experience working at Department of Defense (DoD), Department of State (DoS) or ten (10) years’ experience working International Programs at other USG agencies designated for building partnerships and partner capacity with foreign nations. -Contractor personnel shall have a working knowledge and remain current with the latest version of WINDOWS (e.g. XP), and Microsoft applications (e.g. Excel, Word, PowerPoint, Access, Project, and Visio). 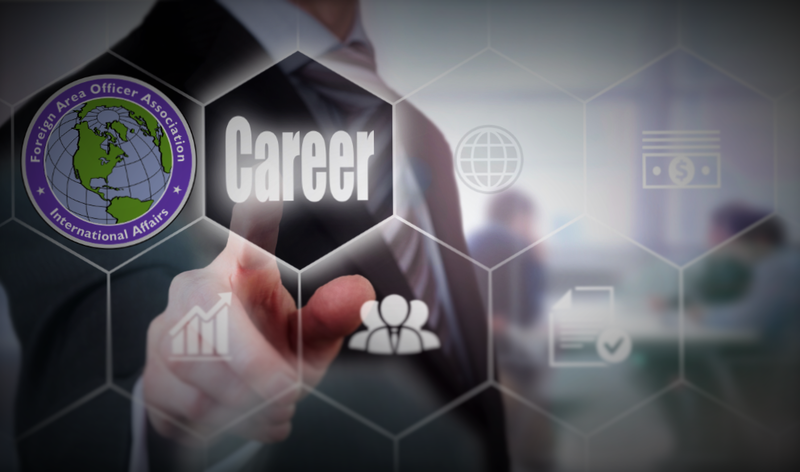 FAOA sponsor, Peduzzi Associates, Ltd., is looking for former Attachés who have successfully completed one or more attaché tours and hold current TS/SCI clearance that are interested in providing Instructor support to the Joint Military Attaché School. The Head of Communications and Monitoring manages the media and public relations functions within the Ambassador’s Office. He monitors US and Middle East media, coordinates public relations activities and provides timely and concise media analysis and reporting to the Ambassador. In coordination with the Embassy Information Office and the PR and Campaign Advisor, the Head of Communications and Monitoring plans, executes and oversees the Ambassador’s media events, speech drafting and spokesperson functions on behalf of the Ambassador and with various media outlets. · 15+ years’ experience in media monitoring, public relations, public affairs, and strategic communications in the private or government sector. The Advance Person is responsible for traveling to a specific destination to arrange the Ambassador’s accommodation, meetings, and personal security. The Advance Person also ensures that event/meeting that the Ambassador is attending is in line with protocol guidelines. The Advance Person works closely with the Social Secretary, as well as the Scheduling Officer and Security Personnel.